¥ An assortment of tools specially designed for cleaning all vehicle electrical connections found in commercial heavy duty fleets. 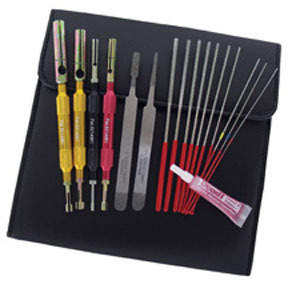 ¥ The HD Fleet TechnicianÕs Electrical Terminal Maintenance Set cleans and repairs most every type of electrical connectors found on cars, trucks, and industrial equipment in North America. ¥ Packaged in a leather type custom holster, the set includes two sizes of flat male and female terminal cleaners, two gold 7 round pin socket harness cleaners, one black ABS sensor/power connector cleaner, ten micro diamond round files, one trailer light bullet connector cleaner and one DeoxIT¨ contact chemical cleaner. WARNING: This product can expose you to Ethylene oxide a chemical known to the State of California to cause cancer and birth defects or other reproductive harm. For more information go to www.P65Warnings.ca.gov.